I know sometimes people roll their eyes at costumes that revolve around a t-shirt. I may have been guilty of this myself form time to time. Over the years my approach to Halloween costumes have varied from months spent crafting and sewing to throwing something together from my current wardrobe. Basically, at this point in my life, I like to find fun, interesting costumes with limited effort. This year, my approach was thrifting (as seen in my series: A Very Thrifted Halloween), whereas, my husband's approach was a t-shirt costume (hint, he is one of the examples below, but uses a different look), which I completely approve of. My change of heart is predicated on more than just ease, but the fact that many great movie characters don tees as their wardrobe. I have sorted through many items to select and curate my favorite characters, but also quality of tees available (if you click on the replica or thrifted example - it will take you to the product page). I hope this inspires you to embrace the theme of Nostalgic T-Shirt Costume, but also to explore your rare and quirky favorite characters to embody for future Halloweens or for everyday life. 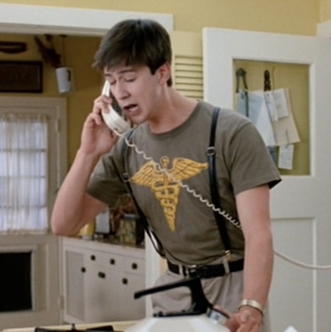 Cameron Frye will always be my favorite character from Ferris Bueller's Day Off. With this Caduceus T-Shirt, anyone can relive the moment he pretends to be Sloane's dad. If your budget allows, you could also grab a vintage or replica of his Howe Red Wings jersey. You can "go to eleven. 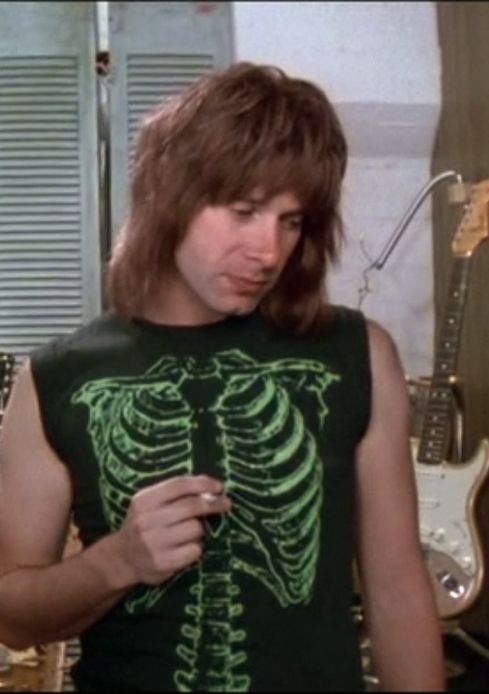 Look, right across the board, eleven, eleven, eleven and..." with this replica of Nigel Tufnel's skeleton t-shirt. All you need to do is cut off the sleeves and you are ready to rock, just like Spinal Tap. We all know Bill Murray is amazing, but before you reach for that Ghostbusters costume (which I do approve of) consider this t-shirt alternative. Bob Wiley's "Don't Hassle Me I'm Local Shirt" will have you uttering "Gimme, Gimme, Gimme, I need I need." T-shirts tend to a common costume for men in movies, but Ariel Moore made her mark with her homemade (clearly iron on letters) "Dance Your A** Off" shirt. If you don't have time, you can find a replica online ready for you to dance the moment it arrives in the mail. When it comes to vampire hunters, Edgar Frog deserves a resurgence in the costume world. He knows, you really don't need a "garlic T-shirt" to take out "The Bloodsucking Brady Bunch!" 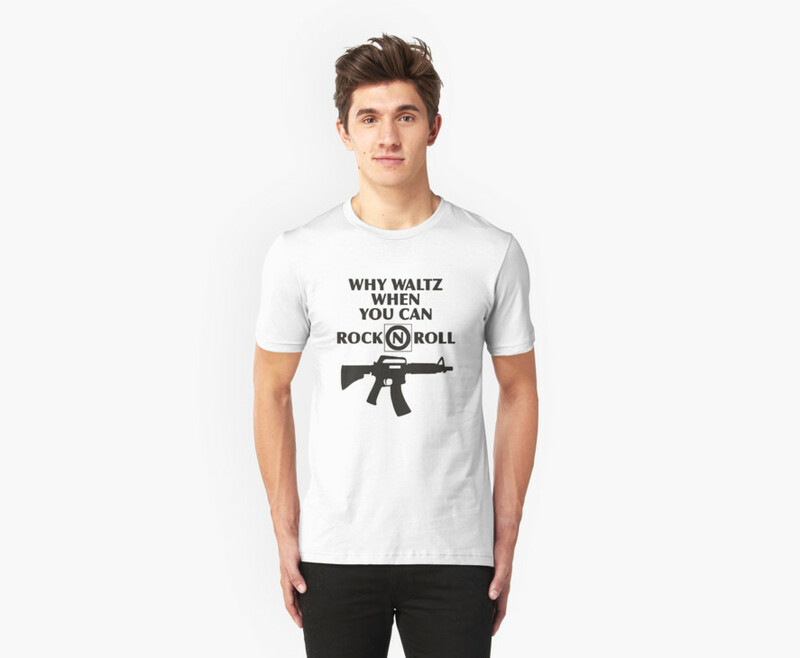 Instead, this replica of his "Why Waltz When You Can Rock N Roll" should do the trick. 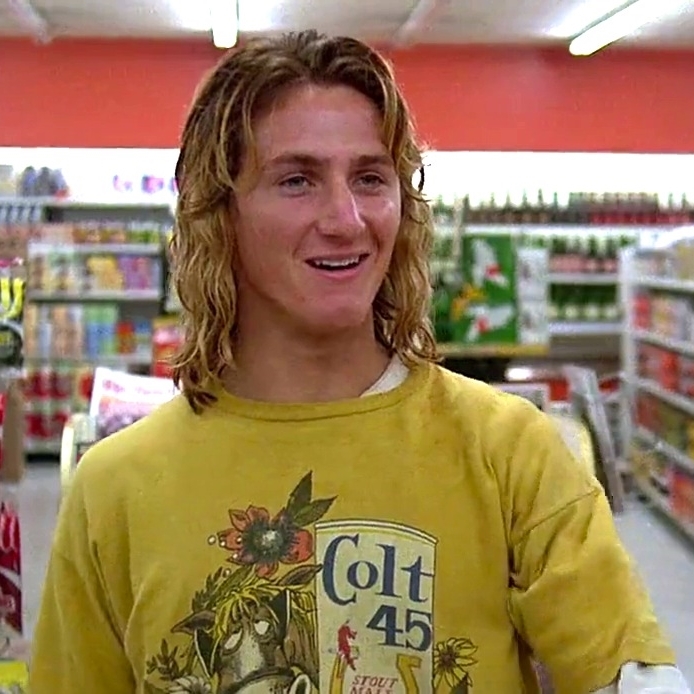 Jeff Spicoli only needed some "some tasty waves, a cool buzz" but all you need to pull off this iconic teen surfer / stoner is a version of his yellow "Colt 45 t-shirt." You can occasionally find a vintage one online, but luckily there are decent replicas popping up as well. You could dress up like a character from Grease (or my preference Grease 2) or you could be a "Greaser" instead. 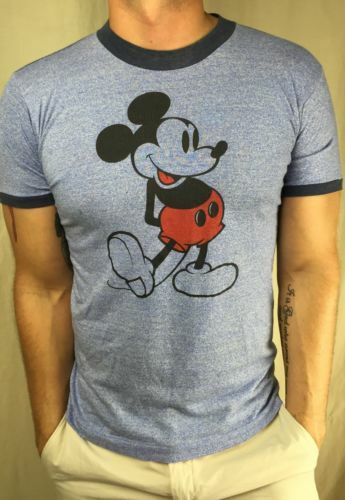 For example, to pull of Two-Bit Matthews style you need a vintage Mickey Mouse tee (sleeves preferably cut off) paired with a leather jacket. Yes, "The Dude abides," but you do not need a robe to always pull off his look on Halloween (or any day of the year for that matter). Consider this my t-shirt alternative example to a full fledged "costume." 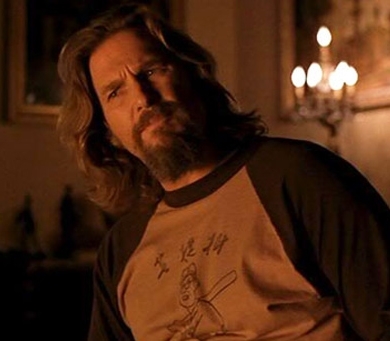 You could choose instead his "Kaoru Betto" long sleeve t-shirt (also worn by Jeff Bridges in The Fisher King) and transform yourself into "his Dudeness, or uh, Duder, or El Duderino if you're not into the whole brevity thing." 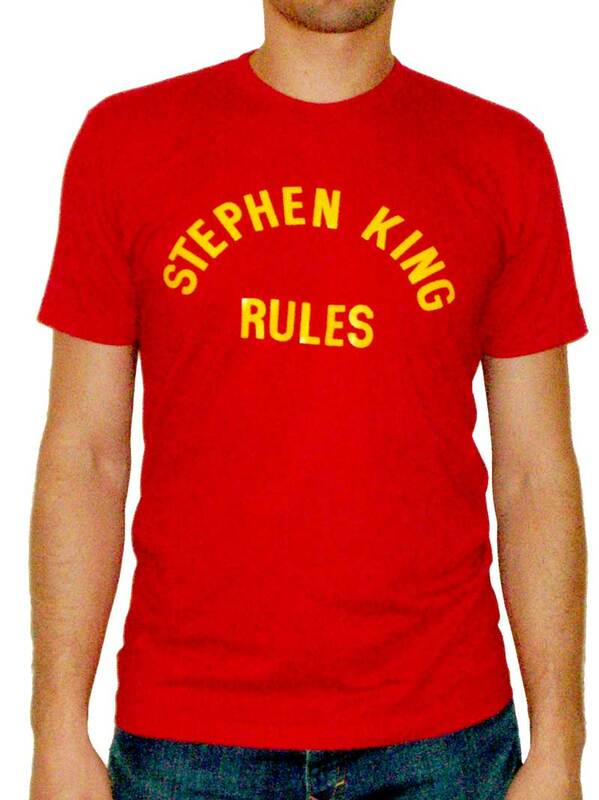 Even if you are not familiar with The Monster Squad, I imagine you might be curious about any shirt that reads "Stephen King Rules." However, if you wear it you might be inclined to start up a club dedicated to monsters, only to find yourself fighting them to save your town. Fair warning! 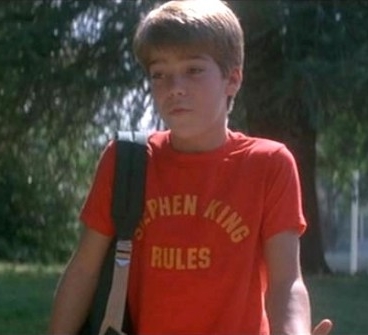 The winner in best t-shirt in any movies single handedly goes to Chris Knight. You can pick any version to transform into this intelligent, charming, quirky prankster / dream boat. 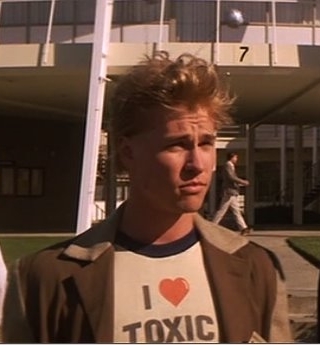 This "I ♥ Toxic Waste" shirt is perfect for job interviews and pairs well with bunny slippers and alienesque antenna.